The Center for Public Affairs Research collaborated with the Nebraska Department of Transportation, the Nebraska Safety Center, and the Nebraska Association of Transportation Providers to organize events throughout Nebraska for the 2018 Nebraska Public Transit Week, held April 8-14. Eastern Nebraska Office on Aging’s driver Kevin clearly loves his job! We talked with him during NPTW about how he drives different types of people and how enjoyable the range of conversations with them are. This particular afternoon he had the joy of delivering a bag of goodies including a NPTW tumbler to his passenger. The City of Neligh held an anniversary party during NPTW to celebrate 40 years of Dial-A-Ride Public Transit. Those attending included past and present drivers, city council members, city officials, and members of the business community. Butler County Transit Service held an open house during NPTW to show off the garage they finished building earlier this year. It has heated floors to help melt the ice and snow off the vehicles. Their open house included a free meal, a live band playing polka music, and swag items like tumblers and grocery bags. StarTran in Lincoln held one of 12 Stuff the Bus events during NPTW. StarTran partnered with Alpha Media, Sam's Club, and Walmart to gather items for Friendship Home of Lincoln, where the donated goods went to help people impacted by domestic violence. 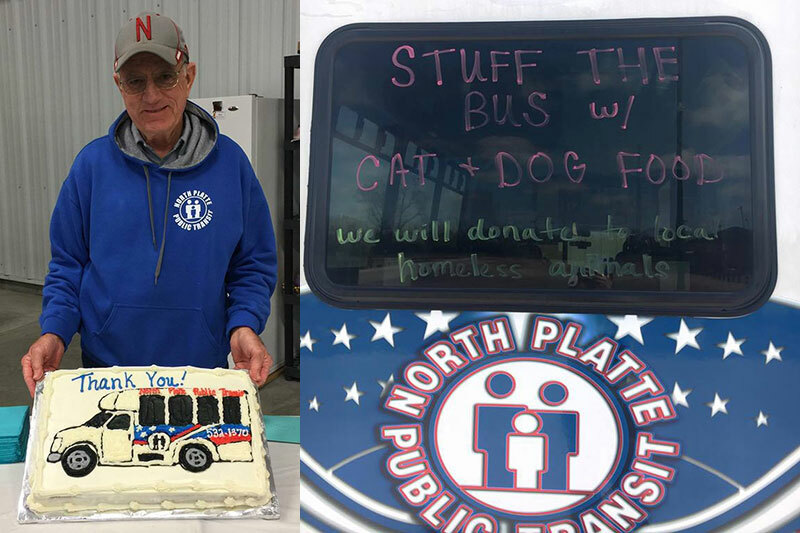 North Platte Public Transit held an appreciation lunch during NPTW to honor one of their drivers, Gary Sierks , who was retiring after 30 years of service. They also held a Stuff the Bus event to benefit the local animal shelter. 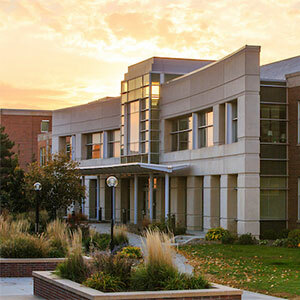 The organization and implementation of an annual NPTW is one activity of the Nebraska Rural Transit Development and Support Subaward, an almost $2.5 million grant the Center for Public Affairs Research receives to carry out transportation projects on behalf of the Nebraska DOT. The projects focus on improving public transit for rural Nebraskans through technology, training, and public outreach. The 2018 NPTW was the fourth annual NPTW and the most successful. Thirty-nine public transit agencies, serving 50 counties in Nebraska, participated, representing a 24% increase from last year. Twenty-six newspapers, 12 radio stations, and three TV stations with over 145,000 combined media impressions covered the NPTW. The Nebraska Association of Transit Providers arranged for the governor to proclaim April 8-14 as Nebraska Public Transit Week and held a breakfast for senators to meet with transit managers and discuss the importance of public transit across the state. CPAR staff members participated on the planning committee and played a major role in promoting NPTW, including the following activities. 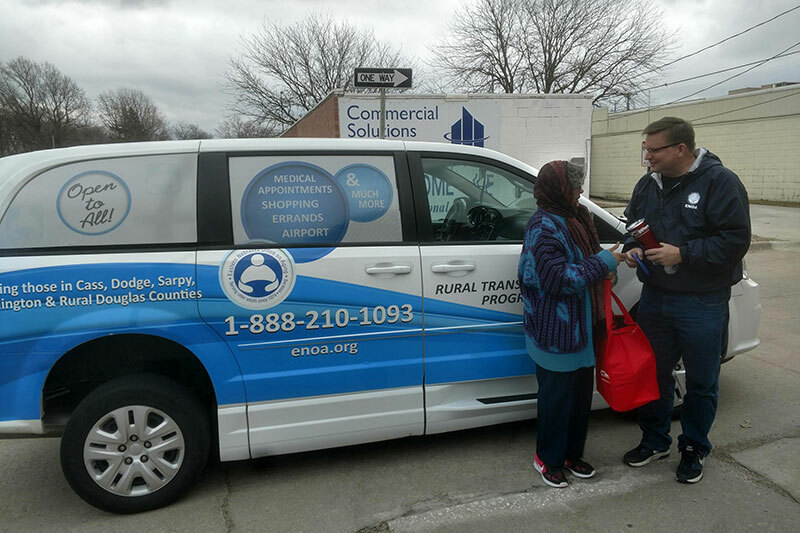 Designed, ordered, and distributed promotional items to participating transit agencies. Designed printed materials such as posters, passenger survey cards, and coupons for use by participating transit agencies. Developed a press packet for transit agencies to send to their local media outlets. Created posts for the Nebraska Transit Facebook page, ranging from statistics showing the importance of public transit in Nebraska to photos and videos of events at transit agencies throughout the state, including one Facebook Live post from the Butler County Transit Service Open Garage in David City. Visited transit agencies during NPTW to help celebrate their events and gather feedback about NPTW. CPAR staff members Tara Grell and Matt Harrington visited eight agencies and staff from the Nebraska Safety Center and Nebraska DOT visited an additional 23 agencies. 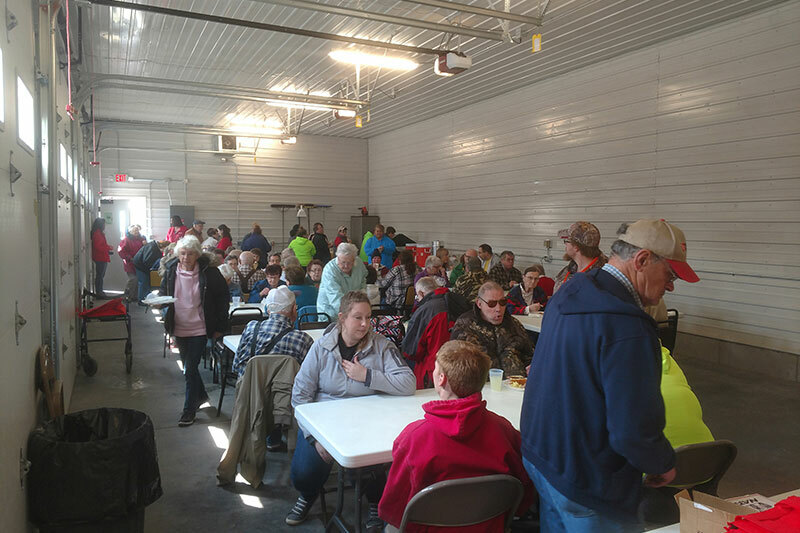 Transit providers held a variety of different events, ranging from a community coffee and breakfast in Neligh celebrating 40 years of public transit to an Open Garage in David City featuring Butler County Transit Service's new transit facility. 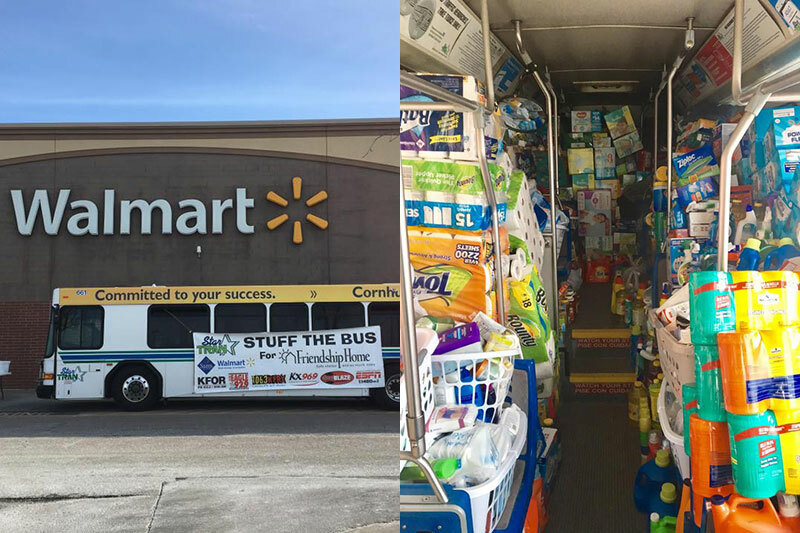 Twelve agencies organized a Stuff the Bus event where members of the community donated items for 19 charities across Nebraska. An Employee Appreciation Lunch was another popular event. 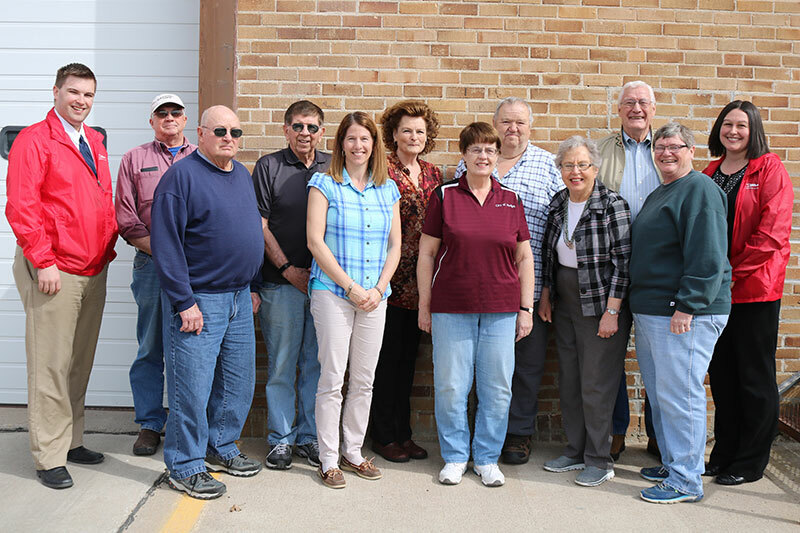 Staff from the Nebraska Safety Center had the opportunity to visit one such event in North Platte where an employee was retiring after 30 years of service. For more information about NPTW 2018, or to learn how you can get involved in 2019, please visit nebraskatransit.com.